Share the news with invitations that are the perfect prelude to your upcoming wedding. Attendance required. 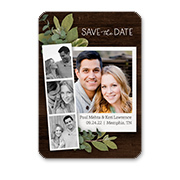 Our elegant save the date cards will make sure they mark their calendars. 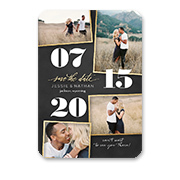 Make sure they mark their calendars with this stylish Save the Date magnet. 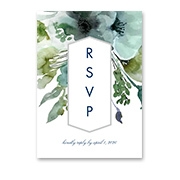 Complete your wedding stationery suite with RSVP cards that capture the style of your big day. That long-awaited moment has finally arrived—you’re engaged! With wedding planning in full swing, it’s time to start thinking about the details that will make your wedding inspiration a reality. 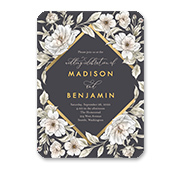 Start your plans off on an elegant note with our collection of wedding cards and stationery from Shutterfly. From the first announcements and save-the-dates to wedding invitations, programs and menu cards, it’s easy to create a personalized, coordinating suite of stationery that fits your wedding style. Choose from a range of designs in several styles and themes, including rustic, modern, traditional, minimalist, floral, seasonal and more. From chic watercolor designs to lace patterns to shimmering foil-stamped options, we have something perfect for every bride-to-be. Whether you’d like to compare several designs or one instantly catches your eye, you can personalize your favorites down to every detail. Choose from various fonts, formats, layouts, card sizes, paper types and trim options to make beautiful wedding stationery that’s truly yours. You can even use our Custom Color Palette to create cards that perfectly match your wedding colors. For each and every step of the wedding planning process, it’s easy to design coordinating stationery that makes an impact on your friends and loved ones. From announcing the big news to sending the thank you cards and everything in between, give your wedding experience a one-of-a-kind personal touch with Shutterfly. When your wedding day comes to an end, create custom keepsakes that help you relive the memories for years to come. Choose from stunning, personalized wedding photo books, canvas prints, shadow boxes and more.